Karen White Interior Design Inc. is a full-service interior design firm located in the Aspen area. Exceeding our client's expectations and providing innovative, timeless, and functional interiors is our highest priority. Every project varies and we take an objective and creative approach to each unique situation. Communication with our clients is of the utmost importance. Our firm utilizes the most current technologies which are incorporated into every aspect of our design, as project requirements allow. We offer the latest technology in 3D drawings. We rely on our computers for many tasks but also take great pride in drawing and sketching each project by hand. It is with this level of commitment and detail that sets us apart. Although we are located in the Aspen area, we have completed successful and award-winning projects out of state. Flexibility to meet clients' needs matches a reputation that exceeds. Aspen's Leading Interior Design Firm Best of Houzz 2014, 2015 & 2018! Established in 1977, Modern Kitchen Center are custom kitchen design experts specializing in new kitchen design and kitchen design remodels. + Locally owned family design and cabinetry company for 35 years. + Design with a Certified Kitchen Designer + Award winning designs, knowledgeable and friendly. Give us a call or come visit our showroom today! kPd Studios | Kristine Pivarnik Design was established to provide quality design solutions to Colorado’s finest residences and commercial properties. We specialize in commercial and high-end residential remodels and new construction, interior and exterior planning. Aspen Grove Kitchen & Bath, Inc.
Aspen Grove Kitchen & Bath is the area's premier showroom, offering a treasury of award-winning design and space planning experience for your new construction or remodeling projects. We work directly with the public, builders, contractors, designers and trade. Proudly serving the Breckenridge, Frisco, Keystone, Copper Mountain, Dillon, Silverthorne and Vail areas in Colorado. Our showroom is open Monday - Friday from 9 AM - 5 PM (appointments preferred) and Saturday by appointment only. We carry cabinetry from Dura Supreme, Woodland, Wood-Mode, Holiday Kitchens, Mastercraft, Medallion, and Designcraft. Design Project, Inc. prides itself on its uniquely personal service between Chris and her clients. Extensive experience in redesign of existing primary and secondary properties and new construction. A philosophy of translating the clients’ vision into their reality. The ability to enhance her clients’ lifestyle by integrating their home with their environment. Chris has the ability to visualize and design the interiors, based on and in concert with both the interior and exterior architectural elements. Unique design service which can bring to life the clients’ dream elements which are not readily available in the commercial market. These may include custom furniture, rugs, lighting, and fabric. Cutting Edge Woodworking is just that – a synthesis of traditional woodworking with the best of modern machinery. 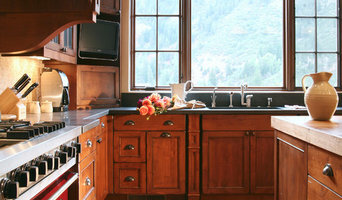 With a growing reputation as the cabinet shop of choice for Colorado’s discerning homeowners and homebuilders, Cutting Edge Woodworking has won the Summit County Parade of Homes (Best Kitchen) for 11 years running. The self-discipline and persistence of Cutting Edge owner Tom Charles has served him well as both master cabinet maker and entrepreneur. Our skilled group of designers, woodworkers, finishers and installers can transform your preliminary ideas into something of enduring beauty. Doesn’t every room in your home deserve furniture-quality cabinetry? Tom Charles brought with him to Colorado a traditional American work ethic born in the rigors of farm life in western Kansas. By the time he opened Cutting Edge Woodworking in 1993; he had become a master cabinet maker and had extensive high-end custom homebuilding experience. Tom believes that honoring his commitments is one of the most important keys to success. “Growing up on the farm,” says Tom, “I learned that when you want something done right you have to do it yourself. If I tell you the job will be finished on time, it will be. If that means working a 70 hour week, so be it. We provide our clients attentive, one on one service, so we are personally involved and desire our customers to be involved to the level they are comfortable.” Tom encourages customers to visit the facility and see the work in progress. We are a full service professional design team with personal service. Highly skiiled in interior design, interior architecture, kitchen design and project managment. Sarah McCoy has over 25 years experience in both residential and commercial design. In her years as a lead designer and project manager in the Vail Valley, Sarah has developed some of the premier properties from Vail Village to Cordillera—ranging from rental condominiums to large custom homes, commercial showrooms, hotel spas and lobbies. Chris McCoy, Design Engineer for McCoy Design Firm, has been involved in the construction industry since 1972. Chris’s 37 plus years of experience ensures that all details are accurately calculated and implemented. Chris has directed projects located in Vail, Beaver Creek, Bachelor Gulch and Aspen. Chris is also a certified Kitchen and Bath Designer. Rocky Mountain Cabinets is a family owned business that has been building high quality cabinetry and millwork for over 40 years. Our family built this company based on a strong commitment to old fashion quality, craftsmanship, integrity, and service. Therefore, the hard work that goes into our products reflect our reputation. The quality of our work led to word-of-mouth referrals, and the business has thrived since Dale and Jackie opened our doors. Ty Winkler began working alongside his mother and father as a young man to learn the process of running the business. Most of our staff have been with us for numerous years, and our family of craftsmen work together to ensure quality and timeliness. Over the years, our shop has expanded to encompass over 12,000 square feet. We still complete every job in-house, using a combination of the most modern automated saws and sanders with old-fashioned hand-carving and refinement. We custom build each piece to complement your personal lifestyle, using the finest woods, unique finishes, and incomparable attention to detail in all finished products. Contact us to schedule your appointment today!